At the core of every living person, there is a longing to get out of Maya—delusion, a need to know the Truth, to answer the universal questions of ‘Who am I? Why am I here? Where did I come from? Where will I go? What is life and what exists beyond it? Why do I suffer? Am I the body, the mind or the intellect? Will living in the world answer my questions? Will it lead to happiness? In this eternal quest there arises the concept of Divinity and God. 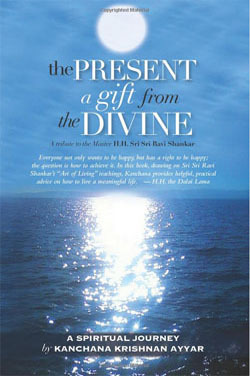 The Present Moment is a gift from the Divine. In that moment at one level, nothing exists yet everything does. At another, nothing matters yet everything does, nothing happens yet everything does. It is the present moment that determines your future. It is in the present moment that you rid yourself of ghosts from the past. You can be truly happy and experience that shift in your consciousness from the mind to the heart. The Present Moment is your chance to renew yourself, make new choices, switch perspectives and reinvent your goals. Every instant is a chance to die to the past and look ahead with enthusiasm and vigor. Having what Guruji refers to as a ‘childlike innocence’ makes you ready to accept the present moment with whatever it brings and still have the capacity to be enthusiastic about the future. It is a brief yet complete vision of divinity. The deluded mind makes you see separateness from people objects and situations. In order to have control over your actions, you develop attachment to people, situations and objects. The delusion here is that the attachment will make you happy. This attachment is known as Moham in Sanskrit. This mental conditioning appears to give a sense of pleasure but in truth is the carrier of grief. Delusion created by the mind is self-sustaining and grows in size, fed continually by the senses. It merely creates an illusion of pleasure by veiling self-knowledge. In spite of having temporary existence it deludes you into a sense of permanence and perverts all relationships and experiences. This river of delusion created by the mind is self-sustaining and grows in size, fed continually by the senses. There can be no liberation from the mind until this veil of ignorance is lifted to reveal the sole existence of that one supreme consciousness that exists in the present moment, mirroring the essence of the Brahman. As long as desires created by the mind are satisfied immediately without any evaluation, the mind will continually create world delusion, presenting objects and people and experiences for attachment. This results in misery when it becomes an obsession. Life, then, is an endless struggle for control and meaning in a quest for harmony and peace. In reality it is this very attachment that binds you, destroying your peace of mind. It is said in the scriptures that humanity was created from a tiny germ of love. When love is the core of our very existence and exists in the nucleus of every cell of our body, we spend lifetimes in search of love hoping that a fleeting embrace, a draught of Morpheus and whiff of fame, or glimmer of gold will provide that elusive moment of love and happiness. The wise and the fortunate turn inward and in a single moment of true bliss realize they are the love they seek. The ultimate goal of all desires is love, yet desires kill the very joy you seek. Behind every desire is that deep need to find happiness. No act is ever committed without a goal of happiness. But the nature of desire is a projection of the confused mind urging you to be object-centered, taking you away from the core. Every desire that is satisfied leads to ten new desires. The adolescent wants to go to college where he can be free from controlling parents. When he is in college, he can’t buy all the things he wants, so he looks for a job. Now that his money is surplus, he wants to buy a car. Once he has the car, he wants new Bose speakers. Now the cost of petrol is too much, so he needs a better paying job, or, even better, he thinks he can ask his parents for more money. Once he has borrowed money from them, he is in debt and once again his parents are in control—the very control he wanted to escape. When you are centered and calm you want nothing and need nothing. Your mind and body are in complete harmony in that moment and the world around you feels perfect. There are many moments like that, most often when you are surrounded by nature. Sitting on the beach watching the waves crest and crash, or examining the colors of the clouds at dusk, or basking in the even calm caused by the steady drone of summer rain. At such moments we experience the peace of a meditative moment, a moment that needs nothing more: it is perfect in itself. That is the gift of the Universe to us. The moment a desire rises, it creates within you a certain restlessness that cannot be stilled until that longing is met. In that period of restlessness you have moved out of your self and are in the grip of mind delusion that is object-centered.